It's that time of year again. Where you scrape up a photo of your family and mail it out with a Christmas letter to people who either know what already happened to you the past year, or people you write to even though you haven't talked to them for years. 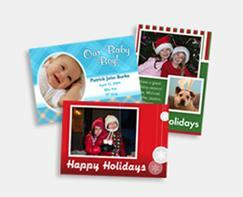 Seehere.com is offering 50 free Christmas Photo cards to anyone who uses the coupon code newbaby at checkout. You will have to pay $3.19 for shipping.